We’re not long back from Bloom 2013 and I’m a bit peckish. 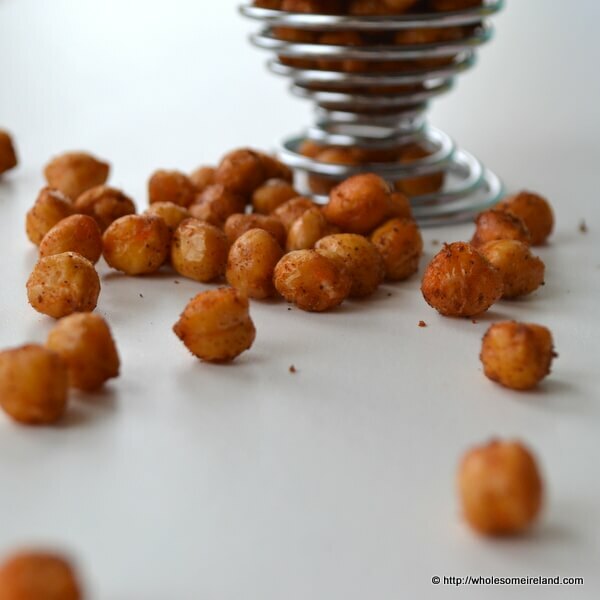 I may have over indulged a little earlier in the day so I decided to make these quick and easy crispy chickpeas which are far more virtuous than my shopping basket! More on Bloom (In The Park) 2013 later on in the week when I have a chance to go through all the photographs that we took and mull over the experience. Today I needed a break from styling and taking food photographs at home. My nerves were at me and those who follow me on twitter may have spotted a panicked tweet yesterday afternoon. To set the scene, it was mid afternoon, I’d been out and done some essential grocery shopping, had a raging headache but was battling through my work. I picked up the camera and fixed the “quick release” panel to the bottom to use it on the tripod. Started adjusting it a bit and…. I screeched so loud himself thought I’d killed someone because the camera had somehow come loose with my adjustment and crashed to the floor. I couldn’t look. The good camera had already gone to the repair shop this year for 3 weeks and I couldn’t afford to lose it now. The important thing is it is working. Thank goodness. Message received loud & clear. I took a break from “heavy” cooking today and went out with the family. Camera around my neck. I’m not letting it out of my sight! To make these crispy chickpeas you can soak and cook your own chickpeas but truth be told it’s a bit of a fuss. The quicker version is to take a tin of cooked chickpeas, drain it and then rinse off the chickpeas inside. Pat the chickpeas dry with some kitchen paper. Preheat your (fan) oven to 190 degrees Celcius and line a baking tray with tinfoil. Pour your dry chickpeas into a large bowl and add 2 tablespoons of sunflower oil along with a teaspoon of dried harissa spice. Stir well so that the chickpeas are individually coated with the oil and spice. Pour the contents of the bowl onto your lined baking tray. Once cooked, remove and leave to cool slightly before eating. Yes a particular favourite with cashews but the fat content is higher & they’re more expensive. No. I saw no caps at all. Sorry hon.